The film is also a Valentine card to Tim Burton, from Tim Burton. This animated movie (entirely in black and white) references many classic horror movies (Frankenstein and Bride of Frankenstein primarily) and certain actors (particularly Vincent Price and Karloff, among others), and is of course an expansion of Burton's original short film Frankenweenie from 1984, about a boy bringing his pet dog back to life, ala' Colin Clive. In this new version of the idea, the citizens of "New Holland" are not unlike the people of Burton's Edward Scissorhands film, though the time frame is positioned to the mid-1960s for 'Weenie. They're small-minded and visually possess an appearance similar to the masks street protestors use in European countries when ridiculing the bourgeoisie. Except for the relatively 'normal' kid Victor Frankenstein, the other children seem either cruel, demented (especially the hunchback), emotionally damaged or just intellectually vacant. In this way the movie is an anti-children's movie, despite the happy ending and a matter-of-fact attitude that adults mean well (though there is evidence to the contrary on display). In the story, a local science teacher, Mr. Rzykruski (Martin Landau) teaches his class a bit more than their Mayor or parents wish, and soon Victor Frankenstein has not only re-animated his dead dog, but his classmates are bringing back their dead pets, too, with mutated results that sends enormous Sea Monkeys, a Godzilla-like Turtle (named 'Shelley,' as in Mary Wollstonecraft Shelley, original writer of the Frankenstein novel), a rat-man creature and a hybrid cat-bat on rampages through the town (with visual nods to Jurassic Park and The Beast from 20,000 Fathoms). 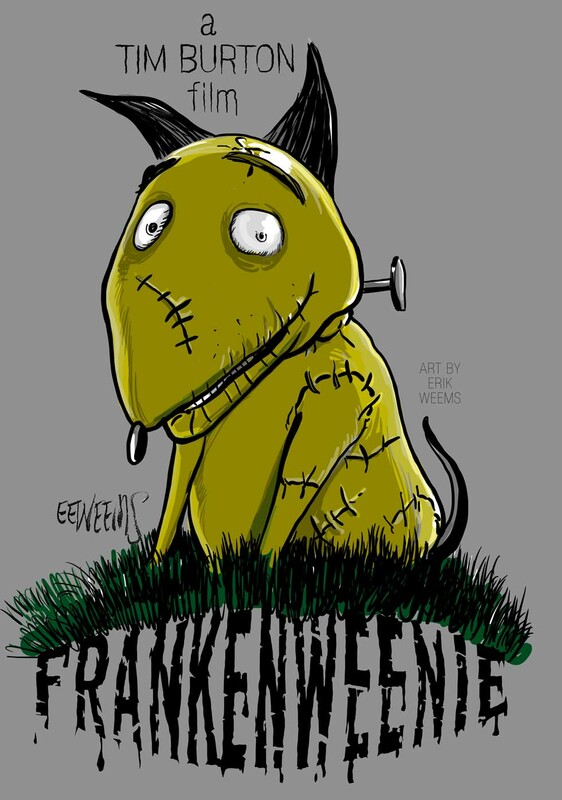 Frankenweenie has a predictable plot if you're familiar with Frankenstein and any of the many parodies that exist. This should not be surprising since children's films typically traffic in themes and ideas that are new for kids but not an older audience, and Burton doesn't exactly advance anything beyond what is to be expected in terms of plot mechanics. On the other hand, Burton does show attitudes and a middle-class grimness in environment that's not like any Disney film I can recall. The stop-motion animation is of course excellent and the black and white photography also excellent and perfectly fitted to the task of evoking old monster movies and the gloomy world of a boy who lost a beloved pet dog.